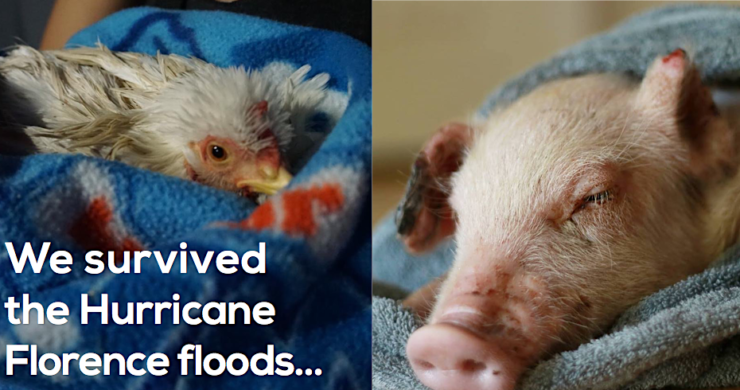 With all the devastating images of farmed animals drowned in Hurricane Florence flooding making their way around the internet, we thought we’d share footage of some of the happier rescue stories and their survivors. To support all of the amazing folks helping these animals, A Well-Fed World is raising emergency funds to assist farm sanctuaries taking in hurricane survivors and/or sanctuaries impacted by the storm. In addition to distributing 100% of hurricane-related funding, A Well-Fed World is matching donations up to $25,000, so the impact of your donation to help animals will be DOUBLED. Donate here. Brother Wolf Animal Rescue’s rapid response team is out in the floodwaters rescuing cats, dogs, pigs, chickens, and wildlife in need. Petunia was rescued from a flooding CAFO where she was found near death’s door. Flesh-eating bacteria had caused the ends of her ears to become necrotic, and she couldn’t walk from a back injury, but now she is joyfully running around Trew Love Rescue & Sanctuary and is on the mend at her new forever home. 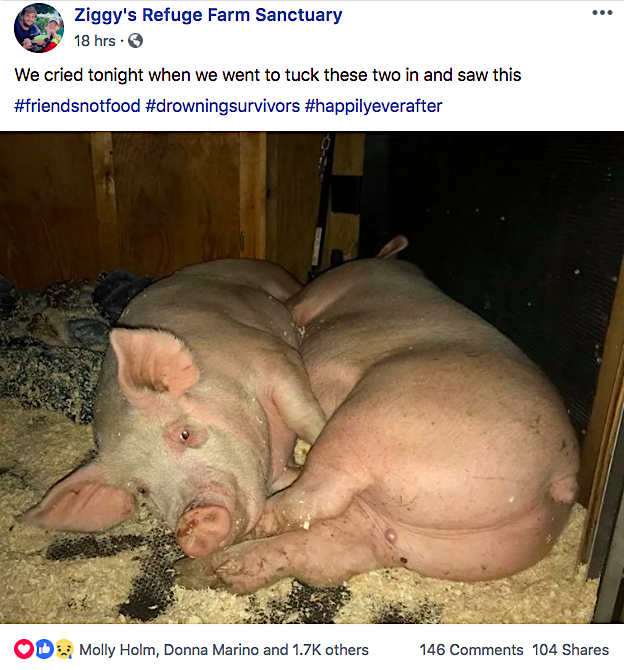 Flo and Jax both escaped from flooded factory farms where they lived confined in warehouses. When search and rescue teams discovered them, separately, both were sick, wounded and traumatized. They are still receiving medical care but have bonded profoundly and will now live safe from harm at Ziggy’s Refuge Farm Sanctuary. At least 75 “broiler” chickens (chickens raised for meat) were saved from post-Florence flooding through the combined efforts of multiple rescuers. The birds are receiving veterinary treatment and quarantine, and will then be rehomed to partner sanctuaries. 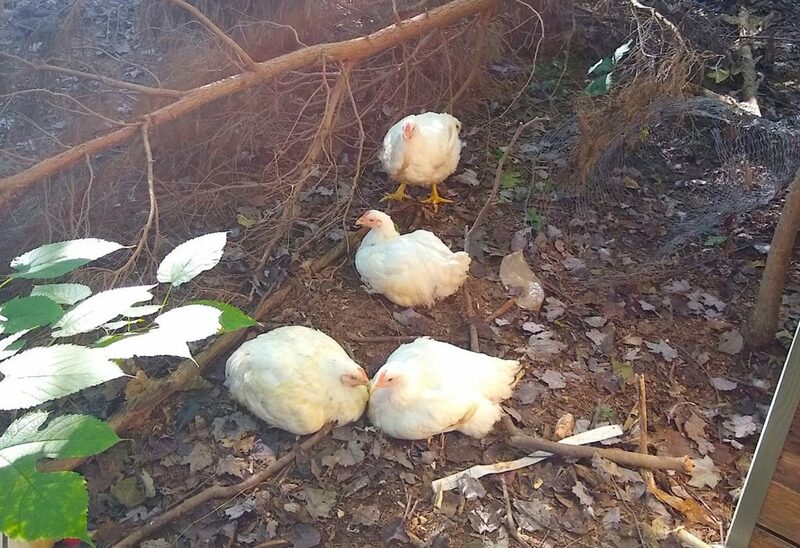 “Broiler” chickens rescued from a flooding CAFO, experiencing the outdoors and a forest (the natural habitat of chickens) for the first time. Support Farm Sanctuaries Caring for Florence Survivors! North Carolina is the second largest pig and chicken meat producer in the U.S., with tens of millions of these animals concentrated in a handful of counties that were devastated by Hurricane Florence flooding. The earliest confirmed death toll for chickens is already at 3.4 million, and more than 5,500 pigs have died, with those numbers projected to easily double once more casualty reports are submitted. Animal search and rescue teams have been on the ground for more than a week looking for companion and farmed animal survivors who were not evacuated. With recovery efforts still in progress, please consider supporting our fundraiser for sanctuaries caring for Florence survivors. And don’t forget, our matching grant means you double your impact for these animals in need!